This lovely apartment complex in Iran boasts more than just good looks. 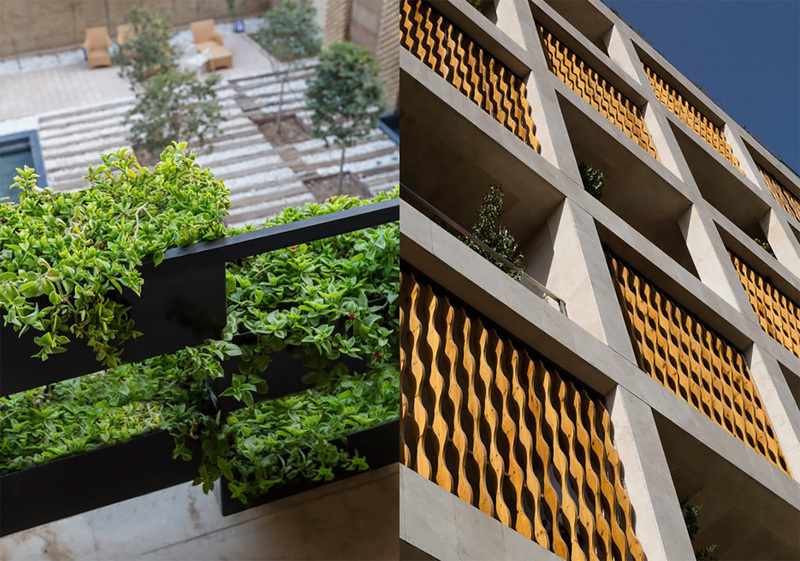 Environmentally preferable materials and renewable systems are at the heart of the award-winning Saba Apartment, a large residential block located in Heravi Square, Tehran. Designed by local firm TDC Office, the building is integrated with local and salvaged materials, solar panels, and an abundance of greenery irrigated with recycled rainwater. Though the Saba Apartment’s sustainable elements are impressive, the building’s most eye-catching features are its wavy timber shutters that cover the street-side grid façade made of square recessed windows. The wooden slats also lend a warm touch to the light-colored stone exterior. The floor-to-ceiling shutters can be swiveled and moved by hand to block unwanted solar gain and for privacy. 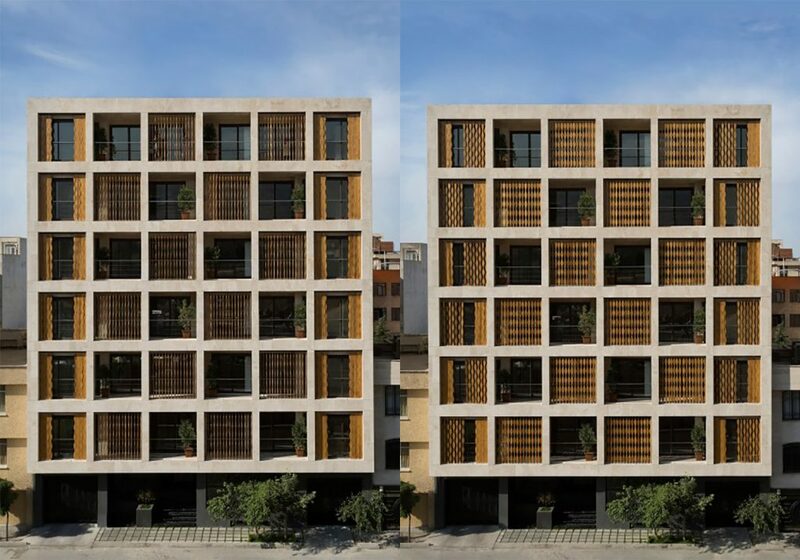 This double-skin facade and the recessed balconies with double-glazed windows help residents keep cool in the Tehran heat. 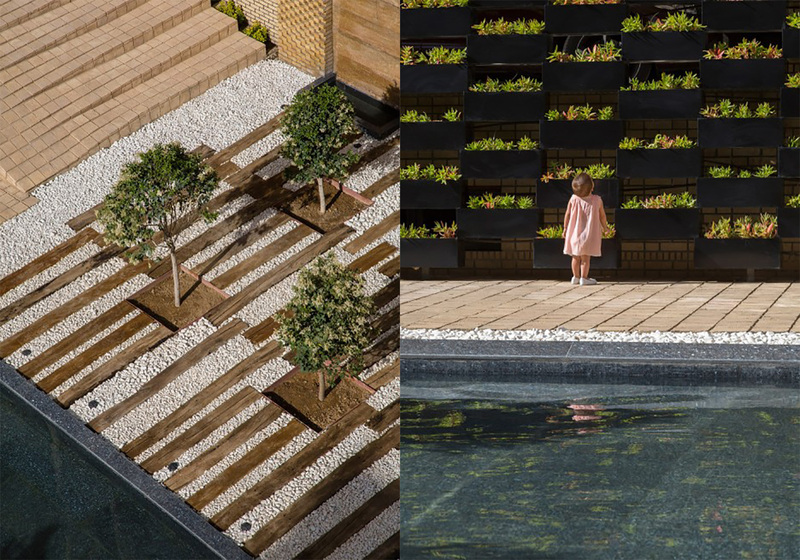 A garden located in the rear comprises a pool, planting beds, and paving made from recycled railway sleepers. The apartment’s garden-facing facade is made from locally sourced and reclaimed brick and covered with modular vertical planters fed drip irrigation using rainwater harvested from the roof. A green roof tops the building and is integrated with solar panels that generate the energy used for lighting the communal areas.